Speaker of the House Nancy Pelosi and a select group of congressional Democrats were boarded on a military charter bus bound for Andrews Air Force Base to catch a military charter jet to Europe were forced to turn around Thursday when President Donald Trump officially postponed the trip. The Duke of Edinburgh has been involved in a car crash near to the Sandringham Estate. The Duke, 97, was driving the car but was not injured in the collision. Norfolk Police and ambulance crews attended the scene, on the A149 on Thursday afternoon, with two people in one of the vehicles suffering minor injuries. The BBC reports that the Duke had been pulling out of a driveway and onto the main road, with an eyewitness claiming that his Land Rover had overturned onto the driver's side. The breach was uncovered last month by Greg Pollock, a cybersecurity researcher at UpGuard, who claims the millions of files were publicly available on an online server and didn’t require any password to access them. Justice Ginsburg today cancelled a public appearance set for January 29, 2019, as she remains in a hospital fighting Pneumonia. The elderly judge appears to be nearing the end of her life, as the Trump administration asks allies for suggestions to replace her. A Chinese drug dealer from a village that churned out hundreds of pounds of crystal meth and ketamine has been executed, state-backed outlet China Daily reported Thursday. Nicknamed the “godfather” of Boshe village in Guangdong Province by local media, Cai Dongjia, 55, was sentenced to death back in 2016, the BBC reported. An SUV carrying more than 150 pounds of explosives detonated at a police academy in Colombia’s capital on Thursday, killing at least nine and leaving more than 50 people injured, according to authorities. Attorney General Néstor Martinez identified the driver of the vehicle — who is thought to have died in the blast — as José Aldemar Rojas Rodriguez. Martinez stopped short of saying what group or groups might have been behind the attack, as the investigation is ongoing. And no one immediately took responsibility for the bombing, which is shaping up to be one of the deadliest in the city in more than a decade. Marzieh Hashemi charged with spying for the Khomeiniist regime and assisting them to bypass sanctions. The 59 year old who is a native of New Orleans and was born Melanie Franklin, converted to Shia Islam and is said to spend much of her time in Iran. “We condemn the illegal arrest of Marziyeh Hashemi, the reporter and presenter of Press TV, and the inhumane treatment of her in jail in Washington,” Bahram Qasemi was quoted as saying by state news agency IRNA. Is Applebee’s serving up a scam? Demetrius Nathaniel Pitts, aka Abdur Raheem Rafeeq, aka Salah ad-Deen Osama Waleed, 49, has been in custody since July, when he was arrested after allegedly planning a terrorist attack in Cleveland. Kevin Winston and Martina Chambers have been charged with aggravated promotion of prostitution, compelling prostitution, and trafficking of a person. Mikia Collins has been charged with compelling prostitution and trafficking of a person. The mother of a 20-year-old victim told police her daughter was being held against her will. Officers were able to find prostitution ads featuring photos of the victim. They contacted Winston and arranged a meeting at a Houston hotel. Sen. Rand Paul (R-Ky.) on Thursday suggested President Trump hold his State of the Union address in the Senate after Speaker Nancy Pelosi (D-Calif.) asked the president to postpone the Jan. 29 address amid the partial government shutdown. 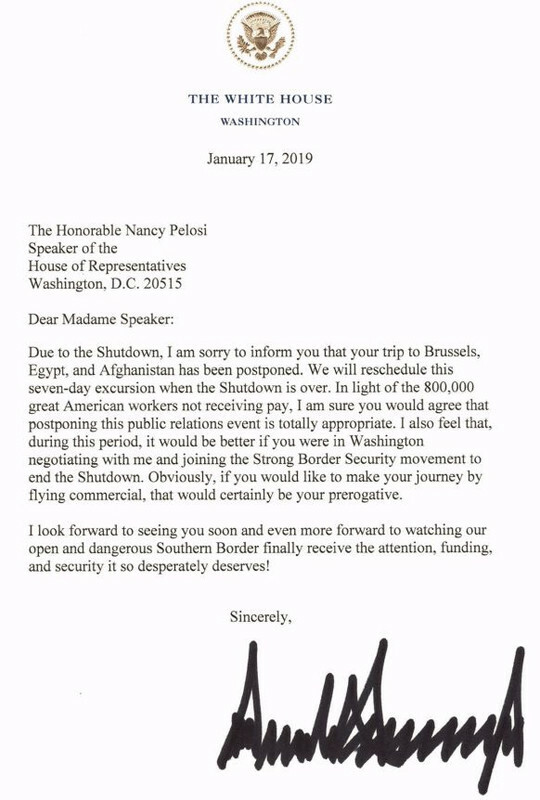 Pelosi made the surprise request on Wednesday, warning that staging the speech amid the partial shutdown — which has affected both the Department of Homeland Security and Secret Service — creates security risks. Paul said it would be the first time in U.S. history that the House denied the president a forum to speak and suggested Senate Majority Leader Mitch McConnell (R-Ky.) should host Trump.